I was a fan of, "The Tonight Show with Jimmy Fallon," when it first came out. It was fun, lighthearted, and silly--a good way to close out the workday. Then our nation went utterly insane and Donald Trump gained political ground before being elected President against all logic. Due to his softball questioning of Trump at the time and otherwise acting all chummy with a monster, Fallon now has basically no respect and is suffering a lot in the T.V. ratings. There has been some sympathy for Jimmy Fallon with people saying he's a, "Nice guy," and that makes him somehow a sympathetic character. The thing is, as this piece at Nylon argues, the, "Nice guy," sometimes is his own kind of dangerous narcissist. 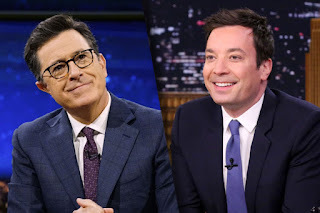 Personally, I got sick of how Fallon seemed more interested in telling fluffy jokes and being friends with all his guests than asking pressing questions of his guests or at least having a monologue with some bite. It didn't bug me too much at first, but then, well, Trump. I used to be at a point where I would sometimes watch Fallon and occasionally Colbert, but over the past number of months I've found myself never watching Fallon and viewing Colbert intently and without fail. 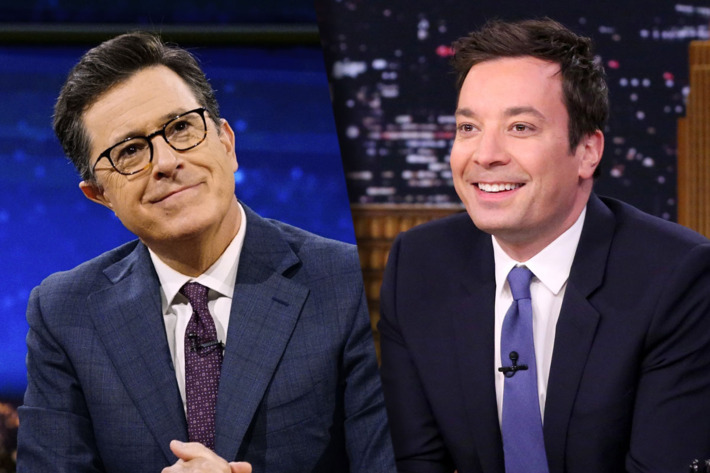 I'm not alone in this either as while Fallon's rating are sinking, Colbert's are soaring. Stephen Colbert is not afraid to, "Go there," even if it has caused controversy when he uses especially shocking language (which gets bleeped, but we know what he is saying). I appreciate he is willing to do so, call-out our joke of a President, and otherwise be funny while making important points. Fallon can keep trying to be a, "Nice guy," but I will be tuning-in to Colbert.